The newest crewmember on the International Space Station, ESA astronaut Paolo Nespoli, has hit the ground running. After arriving in the early hours of 29 July and taking the rest of the day off, Paolo and the crew were back to work by 30 July. First up on Paolo’s schedule is a human physiology experiment using the Mares machine. 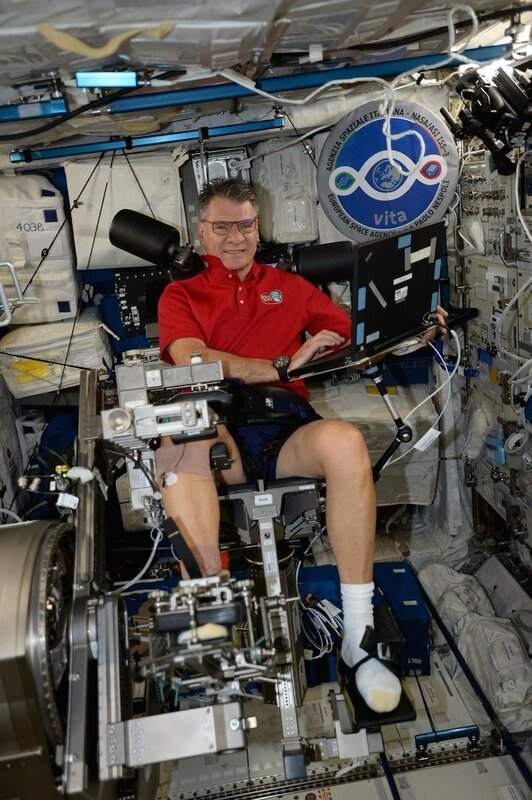 The Muscle Atrophy Research and Exercise System, housed in Europe’s Columbus laboratory module, is a three-in-one muscle-measuring machine that monitors astronauts’ muscles as they work out. Muscle strength decreases during spaceflight and researchers need to know why in order to prepare for long missions and safe space tourism. The measurements are part of the Sarcolab-3 experiment that is assessing how weightlessness affects the calf and ankle muscles, the parts of the leg that carry the load of the rest of the body. “This is important, as establishing the mechanisms involved in space-related muscle deterioration will help us to devise optimised countermeasures,” says Thu Jennifer Ngo-Anh, head of ESA’s Human Research Office. 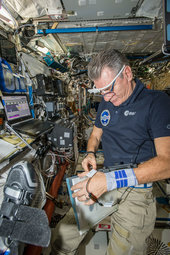 Sarcolab-3 is a unique experiment, involving scientists from NASA, ESA and the Russian Institute of Biomedical Problems – an example of international cooperation benefitting scientific research. Watch a timelapse video of Mares being assembled, an all-day task in itself. 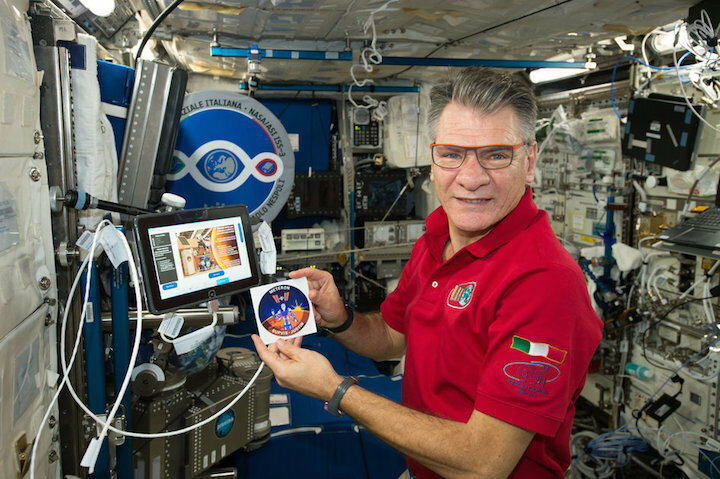 ESA astronaut Paolo Nespoli marks his 100th day in space for the Vita mission. Revisit the milestones and memorable moments of the mission so far. Liftoff of the Vita mission on 28 July 2017 at 17:41 CEST, from Baikonour, in Kazakhstan. ESA astronaut Paolo Nespoli enters the International Space Station after the hatch opened at 23:57 GMT (01:57 CEST) on 29 July. ESA astronaut Paolo Nespoli operated a rover in Germany from the International Space Station 28 August 2017. Part of ESA’s METERON project, the experiment with German Aerospace Center DLR’s robot, nicknamed Rollin’ Justin, is about developing ways to allow astronauts to control robots from orbit. This experiment saw Justin, based in Oberpfaffenhofen, Germany, in a Mars scenario tasked with diagnosing solar panels. Paolo, flying at 28 800 km/h and 400 km above Earth, worked with Justin to inspect three solar panels and find a malfunction. He then instructed Justin to plug in a diagnostic tool read and upload the error logs. These tests were chosen to enact future scenarios in which astronauts orbiting distant planets and moons can instruct robots to do difficult or dangerous tasks and set up base before landing for further exploration. ESA has run multiple experiments from the Space Station with robots to test the network, the control system and the robots on Earth. This is a new area for everybody involved and each aspect needs to be tested. This experiment, dubbed ‘SUPVIS-Justin’, focused on Justin and the user interface used to interact with the robot. 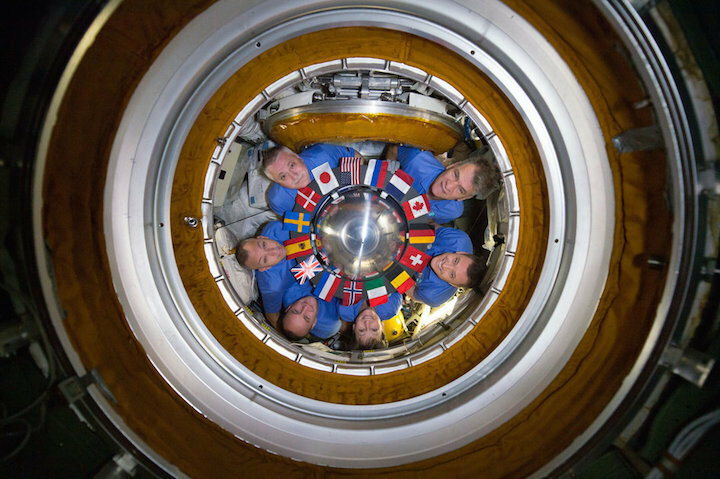 Clockwise from top: ESA astronaut Paolo Nespoli, NASA astronauts Jack Fischer and Peggy Whitson, Roscosmos cosmonaut Sergei Ryazansky, NASA astronaut Randy Bresnik and Roscosmos cosmonaut Fyodor Yurchikhin pose for a photo in the Russian section of the International Space Station. 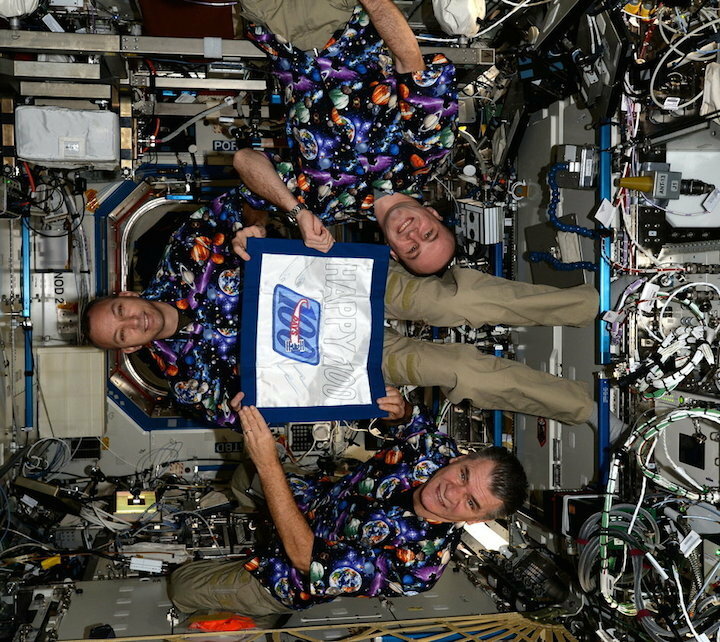 Together they are the Expedition 52/53 crew and all the humans orbiting Earth at this time. The six are positioned around the flags of the nations that built and maintain the Station: USA, Russia, France, Canada, Germany, Switzerland, Belgium, Italy, Norway, The Netherlands, UK, Spain, Sweden, Denmark and Japan. The orbital outpost circles Earth every 90 minutes and offers state-of-the-art facilities for research, allowing the astronauts to run experiments in weightlessness for many weeks and even years. Research opportunities are available to scientists from all over the world – there is no other laboratory like the International Space Station. Next month Fyodor, Peggy and Jack will undock from the Station in their Soyuz MS-04 spacecraft and return to Earth, leaving Paolo, Randy and Sergei, who will become Expedition 53/54 when they are joined by a new trio: cosmonaut and Soyuz commander Alexander Misurkin, and NASA astronauts Mark VandeHei and Joseph Acaba. 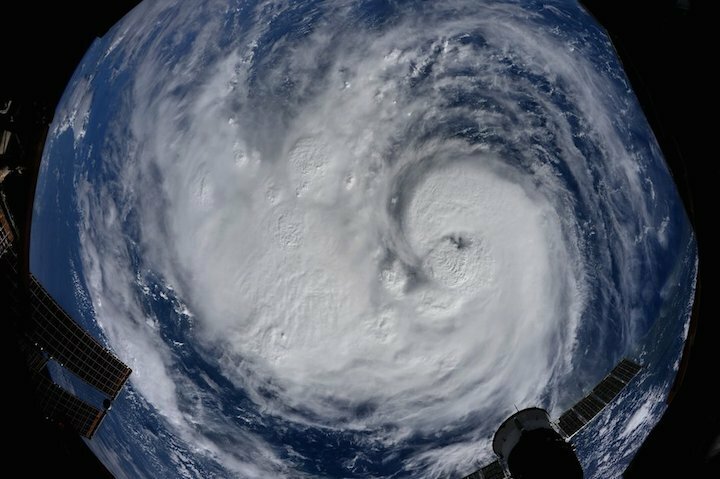 This image of Hurricane Harvey was taken by ESA astronaut Paolo Nespoli from the International Space Station orbiting Earth at 400 km altitude. The hurricane hit mainland USA and caused flooding and damage affecting hundreds of thousands of people. The city of Houston was hit with much of its force including NASA’s Johnson Space Center, the main site for astronauts and the International Space Station. Mission control in Houston remained operational despite the centre being closed from August 28 until 5 September – flight controllers slept on site in makeshift beds as entrance to the facility was difficult due to floods. 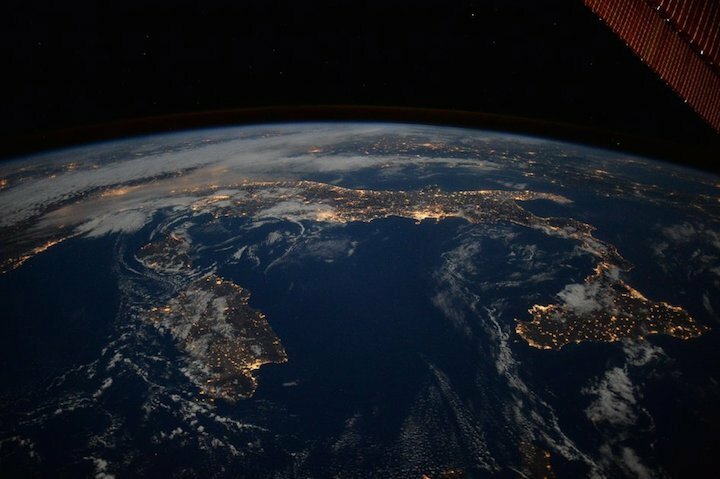 ESA astronaut Paolo Nespoli took this image of Italy, Sicily, Sardinia, and Corsica from the International Space Station. HE posted this image to social media, adding "Passing from West to East I would have got all of #Italy... Too bad it was a bit cloudy in the North!" Follow Paolo during his Vita mission at paolonespoli.esa.int and the Vita mission blog. ESA astronaut Paolo Nespoli took this picture during the total solar eclipse of the Sun over the US on 21 August 2017. From their unique vantage point 400 km above Earth’s surface, astronauts aboard the International Space Station saw the Moon’s fuzzy shadow on the surface of our planet during the eclipse. 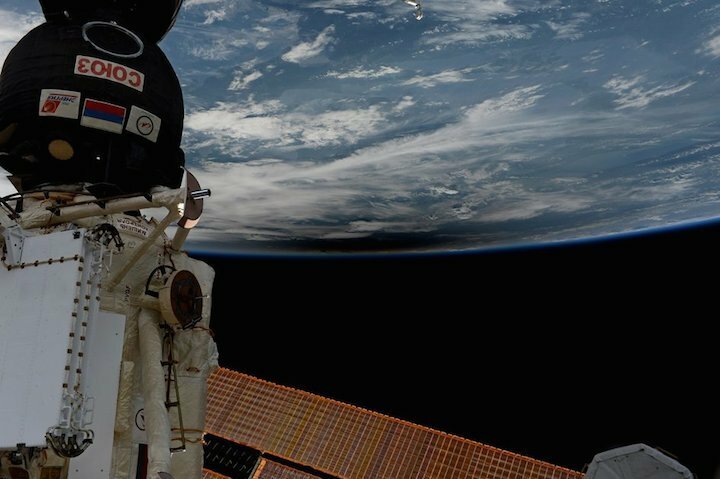 The space station crossed the path of the eclipse three times on its 90 minute-long orbits around the Earth. 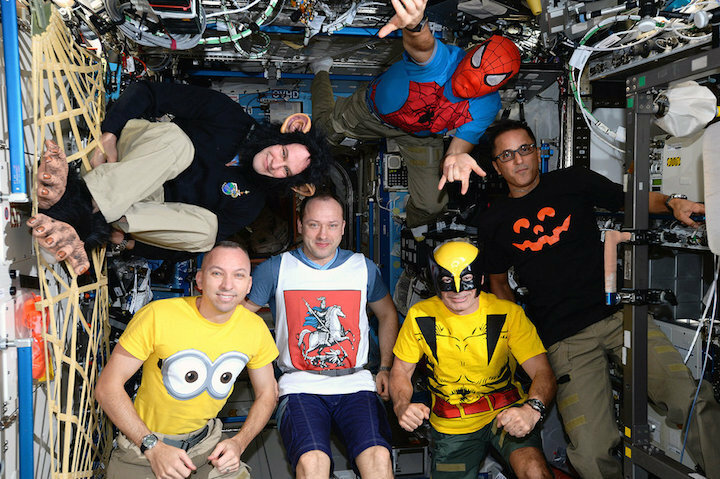 No-one on International Space Station wanted to be an astronaut for Halloween, 31 October 2017. 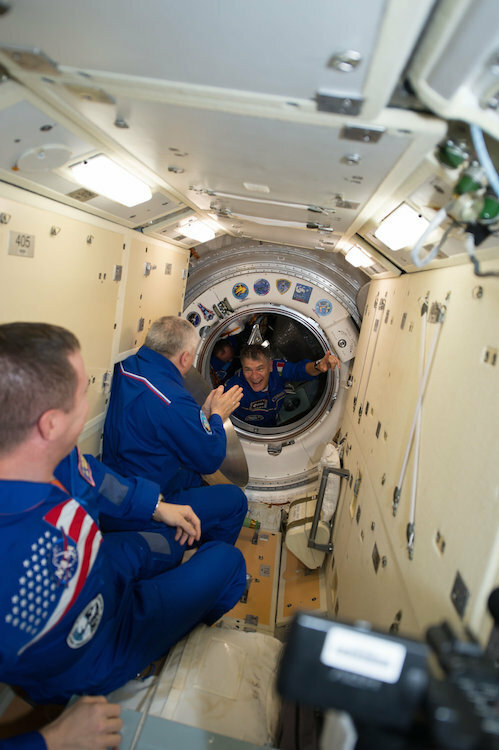 ESA astronaut Paolo Nespoli marked his 100th day in space for the Vita mission on Sunday 5 November along with fellow Expedition-51/52 crew mates Randy Bresnik of NASA and Sergey Ryazansky of Roscosmos. 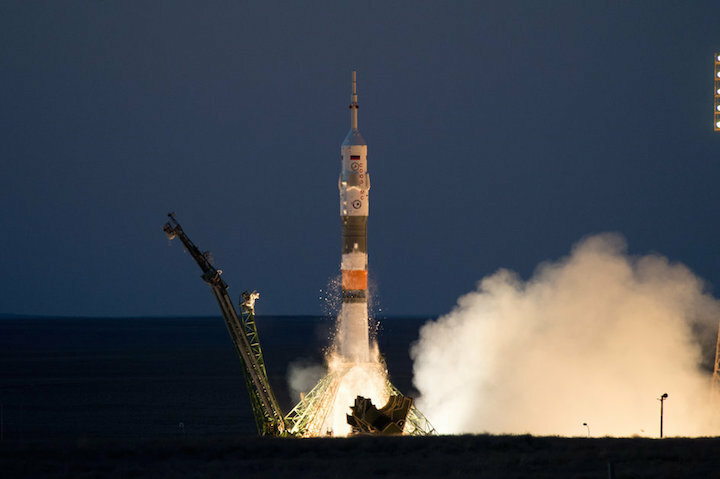 The trio were launched to the International Space Station on Soyuz MS-05 on 28 July 2017 from Baikonur Cosmodrome. In 100 days Paolo has conducted numerous experiments and technology demonstrations, had calls with schools and most notably His Holiness Pope Francis, and captured stunning images from space, including the many hurricanes ravaging the Atlantic and the solar eclipse across the US. Paolo, Randy and Sergey are set to return to Earth on 14 December. 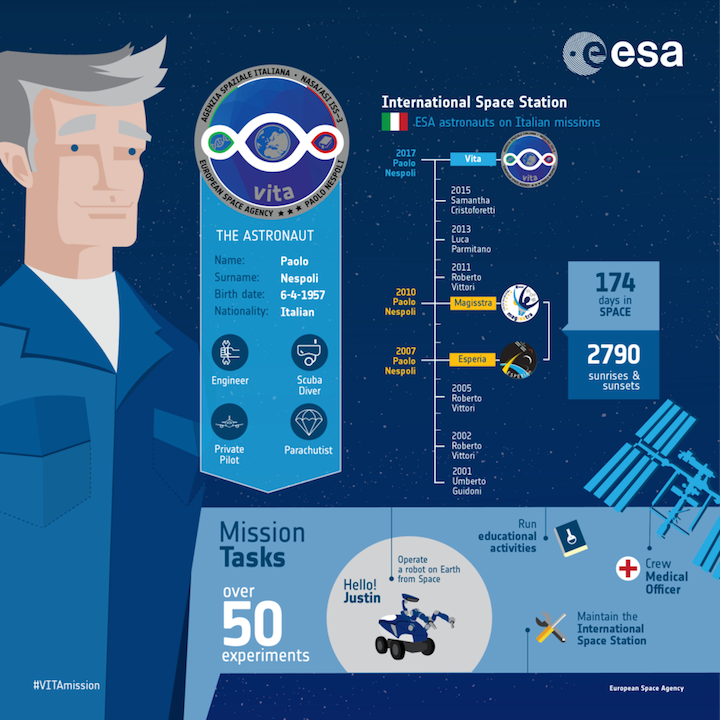 Brush up on ESA astronaut Paolo Nespoli's long career as an astronaut, his previous missions, and the objectives of his upcoming VITA mission, launching 29 July to the International Space Station from Baikonur Cosmodrome.